This turns KILL BILL into a single sitting 3 1/2 hour experience and adds clips of Pai Mei from classic Shaw Brothers films over the campfire sequence according to Tarantino’s original screenplay. 1. To make KILL BILL a single sitting 3 1/2 hour experience. 2. Add clips of Pai Mei from classic Shaw Brothers films over the campfire sequence according to Tarantino’s original screenplay. This is different from both THE WHOLE BLOODY AFFAIR cut and Jorge’s Kill Bill X cut, which also had some Pai Mei clips — but does not cover the entire campfire sequence. I think the campfire sequence between Bride and Bill plays differently with the addition of the clips. It also sets up Pai Mei’s character a bit better. It was in QT’s original script to use clips from original Pai Mei films — but he never followed through in the films. 4. Added bonus Bill scene in marketplace before Bride meets Bill in Final Chapter. 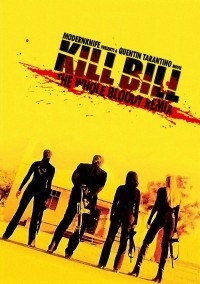 Added new KILL BILL title card. Yellow with original poster font. Removed a few lines at the opening of the church. Added clips from classic Shaw Brothers films with Pai Mei over the campfire sequence with Bill & Bride. No end credits, just the Written & Directed By credit.